Best Tree Stands Reviews The right tree stand helps you stay hidden from your prey, but still have stable footing while you shoot. 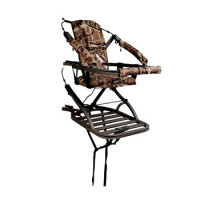 This will make your hunting trips more successful! A tree stand provides you with a good vantage point for visibility, while keeping you far away, beyond the deer’s line of sight. At the same time, it ensures that your scent is not easily detected by the wild game down below. However, when you spend that much of your life in a tree, it means you shouldn’t buy just any unit you find on the market. 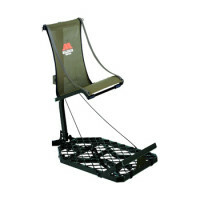 Reviews Bee will help you choose just the right one by providing information and a chart for you to compare only the best climbing, ladder and hang-on style tree stands. Take one quick look at a sporting goods store, and you’ll see there are a few dominant categories of hunting tree stands, including the fixed, climbing and ladder stands. Here are some things you’ll want to know about them. Fixed­stands are platforms that you attach to a tree using straps, chains, cords, rope or a combination of two or more of these connectors. The stand has a large, flat side that rests against the trunk of the tree. The restraints secure the stand to the tree. Before using a fixed stand for the first time, you should attach it to the base of a tree, cinch the restraints tightly and test the stand thoroughly. You should check to make sure it will support your weight an whatever gear you are taking up with you, without making any noise. It’s better to find out about any problems while you’re only a few feet off the ground than when you’re 20 feet up and in a remote location, miles from help. To attach a fixed stand further up the tree, you’ll need climbing gear (not included), to get to the right height. 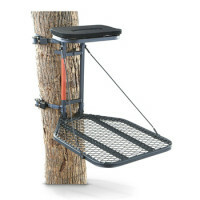 The climbing stand is the one of the most portable tree stands on the market. These stands can easily be carried in and out of the woods with backpack straps. The climbers allow a hunter to move to new locations, adjust the height and the direction the stand faces, quickly and easily. The down side of climbing stands is that the tree needs to be reasonably straight, free of branches up to the height you want to climb and big enough to support the stand. Climbing tree stand reviews show that they are ideal for the hunter that hunts on land that requires you to remove the stand when not in use, or for the person who wants to try new hunting areas. 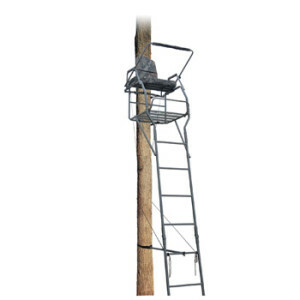 Ladder stands, as the name implies, are stands attached to the end of a tall ladder. 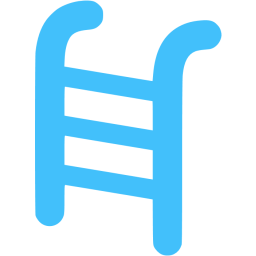 You secure the ladder to a tree using safety restraints and then climb the ladder to get to the platform. 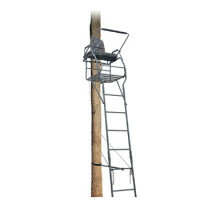 In general, it’s easier to climb up and down a ladder stand than most other kinds of stands. But there are a couple of disadvantages you will want to know. One downside is that they aren’t easily portable. 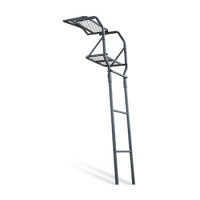 Ladder stands are big and bulky. 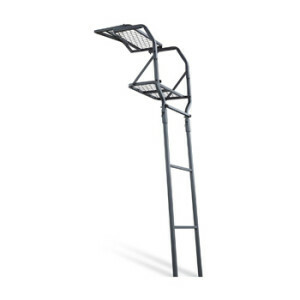 If you are able to leave your ladder stand set up in one place for a long time, perhaps the whole season, this will not be a problem for you. They can also be heavier than, for example, climbing tree stands. It may take more than one person to carry it to the spot where you wish to set it up. It will require that second person with taking it down, as well. Another problem is that it’s not difficult for deer to spot ladder stands. But if you set up a ladder stand, leave it for a few days and then come back to it, you may find that the deer have become accustomed to the stand’s presence and they will no longer steer clear of it. This will once again, give the advantage to the hunter. 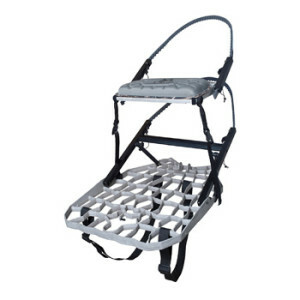 Hunters need a secure and comfortable perch, that’s easy to pack and carry on the move. 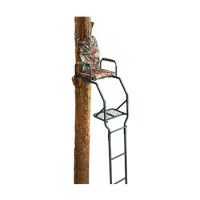 Safety and functionality are key when selecting your tree stand. 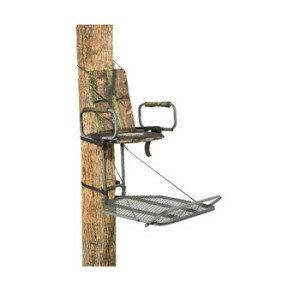 Here’s what you should consider when choosing the best tree stand for you. One important thing you should inspect is your tree stand accessories, which could include umbrellas, shooting rails, a tree stand blind, pull ropes, camera arms, and bow or firearm holders. All of these should be in good, working order before you go up into the stand. Check your climbing stand accessories, such as the safety chain between the upper and lower sections, to make sure you don’t end up stuck in a tree without a way to get down. Not enough can be said or written about safety in a tree stand. Whether you are a novice hunter or a seasoned deer hunter, this is a very important thing. Many manufacturers have started to provide a safety harness of some sort with the purchase of their stands. You need to fasten yourself to the tree when you are climbing it and also when you are on the tree stand. It could save your life.You can always take a tree stand safety course given by different organizations, in order to ensure that you really know how to make the most of a tree stand during hunting. The course can also teach you many safety procedures for different situations, some of which you might not be able to imagine. That being said, there are some basic pointers you really need to focus on when using a tree stand, so be sure you are well acquainted with them before your hunting trip. 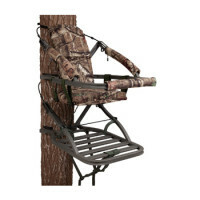 Aluminum and steel are the two most common materials used in the construction of tree stands. Newer carbon materials are lighter in weight than steel and aluminum, yet maintain the same amount of rigidity. 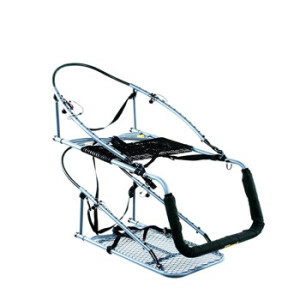 Most ladder stands and lock-on stands use ratchet straps or similar material straps to hold them in place. These tree stand ratchet straps deteriorate over time, especially if left outside, and can break unexpectedly. Checking them out before each hunting excursion, is a wise course of action. Another common problem with tree stands that are made out of steel is that they rust. Even with proper care, metal stands made of these materials will likely develop rust at some point, simply from being exposed during hunting season. There is no way to avoid it since it is exposed to outdoor elements. Also pay attention to the welded areas and make sure nothing is bent or looks like it could break suddenly. Test them by applying some pressure or weight to see if they remain rigid or show some sign of weakening. A tree-stand safety harness says it should last for five years under normal conditions. If your tree stand is used in the fall, then it needs to be replaced afterward. Otherwise, it’s just a matter of inspecting it for normal wear and tear. Take care before the season starts to really inspect your stands for any old or worn parts that need to be replaced and do so promptly. Common items that should be replaced include straps, cables, and bolts. If you notice large rust spots, seriously ask yourself if it’s time to replace the whole thing. Your personal safety is worth more than money. If everything seems alright structurally, you are good to go. In that case your tree stand will serve you many years. The total Reviews Bee rating sums up the overall picture of every product. Reviews Bee works tirelessly to ensure that we are providing the best product recommendations to you and your family. In rating the various tree stands available, we strive to give you the best information possible.Our algorithm includes information from both expert and consumer resources. There is no need to spend hours on researches, because Reviews Bee instantly gives all researches and analysis for you and creates a Top list to save your time and money. 2. We Analyze the Data Expert Popularity Score, Expert Ratings, Consumer Popularity Score, Consumer Ratings and Consumer Complaints are inserted into our algorithm in order to calculate our Reviews Bee Score. This score, in turn, is used to rank each tree stand in our Top 10 recommendation. The Reviews Bee score is a summary of each of the most important factors indicating the value of a tree stand. 3. We Deliver The Best Results By taking each of these essential factors into account, we are able to give each tree stand an overall Reviews Bee Score that ranks each product against the others in our Top 10 list. By using a vast array of expert and consumer ratings, reviews, and feedback, Reviews Bee provides you with the most comprehensive analysis of product information available to you. You can make your purchase knowing that the best research was utilized to make your decision. We came up with the popularity score for every tree stand provider while analyzing 22 expert sites that are trustworthy. Based on our detailed evaluation, each tree stand is assigned an expert popularity score based upon how many times each product is positively mentioned by experts in the industry. By analyzing all the expert review sites our algorithm summed up the average ranking for every tree stand in their rankings and that is how we came up with the final score for each tree stand brand. We managed to gather more than 6557 reviews from 78 reliable sources and our algorithm calculated the average score for each brand. In order to understand how satisfied those consumers were, we analyzed the total number of reviews. We collected all the reviews and the number of stars people gave for each product. Based on these findings we came up with the average customer rating. This is how we managed to bring out the tree stand reviews through which you know how the consumer can rate the tree stand. Through this, we show both sides of the product whether it’s positive or negative in nature. This then makes it a negative factor in our algorithm. This as a result makes the best tree stands reviews. That is why tree stands reviews not only have positive comments mentioned but also the negatives as well.